The coming flight of Apollo 11 captured more worldwide attention than any previous mission. Countless numbers of persons tried to identify with, seek a meaning for, and fashion or obtain some keepsake of mankind's first visit to a celestial neighbor. These desires were expressed in poetry, in prose, in symbolic articles, and in pictorial evidence. Whole issues of journals, sections of newspapers, brochures, television and radio specials, books, bric-a-brac, stamps, medallions, photographs, pieces of clothing, record albums, and magnetic tape records commemorated the occasion. Some persons made suggestions, some bluntly demanded a piece of the moon, and some sought to get as close as possible to the launch and flight control sites. Most of the millions relied on radio, television, and newspapers for a firsthand account of the manned lunar landing experience. NASA officials moved carefully and deliberately in meeting the demands brought on by Apollo 11. Early in 1969, Julian Scheer, Assistant Administrator for Public Affairs in Washington, wrote Gilruth, stressing past policy and operational philosophy. The agency, Scheer said, did "not seek coverage of space but [would] break our backs making our facilities and our people available," with "no free rides, no free meals, no glad-handing." Slayton gave in on a few points - some parts of training, for example - but dug in his heels on the other demands. "Homes and wives are personal," he snapped, "and landing on the moon does not change that." Slayton remarked that he did not think any "hard sell" was necessary for Apollo 11, adding that "one rose does not make a summer (or something like that)." He went on, "This is just another mission which may land on the moon first, but definitely will not go anywhere on schedule if we cannot keep the crew working instead of entertaining the press." Scheer also suggested that top-level officials from both Headquarters and the field elements - most of whom were more used to writing memoranda, notes, and papers for technically oriented audiences - participate in drafting articles directed at the public for a New York Times project. In April, he asked these managers to make out invitation lists for the next two launches and to choose a cross-section of guests who had no direct connection with aerospace activities and who had never seen a launch.37 With the approach of Apollo 11, Scheer assumed a stronger, more aggressive role in NASA's public affairs, and he used the pressures of the mission as a lever to get the agency to accept his thinking. Shapley's committee released its decisions on 2 July. Only the flag of the United States would be unfurled and left on the moon. Miniature flags of all the United Nations, the United States, its 50 states, its territories, and the District of Columbia would be stowed in the lunar module and returned to the earth. Other items to be brought back included a stamp die, a stamped envelope (to be canceled en route by the crew), and two full-sized United States flags that had flown over the two houses of Congress (to be carried in the command module). Personal items would be carried by the pilots in their kit bags, after approval by Slayton. 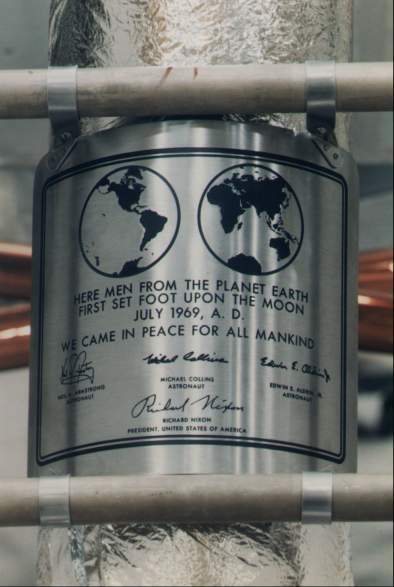 Plaque on the landing gear of the Apollo 11 lunar module. The descent stage would remain on the moon, a permanent commemoration of the first visit at the landing site. Collins mentions in his book that two of their "non-technical chores [were] thinking up names for our spacecraft and designing a mission emblem." Scheer had cast a jaundiced eye on the call signs selected by the crews of McDivitt and Thomas Stafford. He urged Low to make sure those chosen for the lunar landing, "to be witnessed by all mankind," were more appropriate. Low and Armstrong agreed that the names should not be frivolous. At the end of May, Slayton submitted a patch, which Headquarters turned down. It depicted an eagle (an obvious name for the lander) carrying an olive branch in its beak and descending to a lunar landscape, with "Apollo 11" at the top of the emblem. Headquarters thought the eagle's extended talons looked menacing. Although shifting the olive branch from the beak to the claws presented a more reassuring aspect (and won Headquarters approval), Collins facetiously wrote that he hoped the eagle dropped that branch before he touched down. Collins had his own problems in choosing a name for the command module. He was still wrestling with the task in mid-June. He credits Scheer with suggesting the name "Columbia. "45 So the ceremonies and symbols of Apollo 11 were finally set. * The committee comprised Homer Newell, Mueller, Lieutenant General Frank A. Bogart (alternate), Phillips, Thomas E. Jenkins (alternate), Gilruth, Johnston (alternate), von Braun, Debus, Paul G. Dembling, Scheer, Arnold W. Frutkin, and James L. Daniels, Jr. (secretary). 34. Julian Scheer to Gilruth, 3 Jan. 1969; MSC news release 69-38, 22 April 1969; Perry Michael Whye to James M. Grimwood, 3 Oct. 1977, with encs., especially questions, Whye to Lt. Col. John A. Powers and Powers to Whye, 16 Dec. 1976, with enc. ; Paul P. Haney to Whye, 17 Oct. 1977, with encs., Gilruth to Haney, 21 April 1969, and Whye, "Heroes, Not of Their Own Accord (An examination of the publicity concerning the United States astronauts from 1959 to 1972)" (Master's thesis, Iowa State University, 1977), pp. 309-10, with Haney's remarks. 35. Scheer to Slayton, 31 March 1969. 36. Slayton to Scheer, 15 April 1969; Low to Gilruth, "Public Affairs activities in connection with the lunar surface demonstration," 17 April 1969; John Noble Wilford, "Astronauts Simulate Their Moon Activity, New York Times, 19 April 1969; Low to Gilruth, More on Public Affairs activities in connection with the lunar surface demonstration," 18 April 1969; Slayton to Public Affairs Officer, "Public Affairs access to Apollo 11/12 crews," 29 May 1969; "Crew reveals mission 'firsts' in conference," MSC Roundup, 11 July 1969. 37. Scheer to Homer E. Newell, Phillips, Wernher von Braun, Robert Jastrow, Low, Charles A. Berry, and Rocco A. Petrone, 18 April 1969; Scheer memo, "Invitations for Apollo 10 and 11," 3 April 1969; Duff memo, "Apollo 11 invitation list," 30 April 1969; Scheer memo, "Invitations for Apollo 11," ca. 7 May 1969; note, John O. Annexstad to Grimwood, with manuscript pages of this volume, annotated, n.d.
38. Slayton to Mgr., ASPO, "Lunar surface TV," 15 Oct. 1968; Phillips to Dir., Planetary Prog., "Goldstone (DSS-14) 210 foot [64-meter] diameter antenna," 15 Jan. 1969; Phillips to Assoc. Admin., OMSF, "LM Steerable Antenna versus Erectable Antenna," 7 April 1969, with enc., George H. Hage to Dir., Apollo Prog., Subj. as above, 7 April 1969; D. R. Anselmo memo for Bellcomm files, "Goldstone and Parkes Visibility Of Lunar Landing Sites - Case 310," 1 April 1969, with enc., "Apollo TV Uses on Lunar Surface"; Low to Phillips, 4 June 1969; Stevenson to Gerald M. Truszynski, "Parkes 210' Antenna Support for Apollo 11," 18 April 1969; NASA, "Australian 210 Antenna," news release 69-72, 13 May 1969; Holcomb to Apollo Mission Dir., "'G' Mission Lunar Surface EVA Coverage by 210-Foot Dishes," 29 May 1969. 39. Phillips to Low, "Lunar Surface Television," 10 April 1969; Low to NASA Hq., Attn. : Phillips, "Lunar surface television," 18 April 1969; OMSF Weekly Report, 2 June 1969; Phillips to MSC, Attn. : Low, "Apollo On-Board Color TV," 13 June 1969; Haney to Dir., E&D "Lunar surface television proposal," 14 March 1969; Faget to Public Affairs Officer, "LM ascent TV analysis," 20 March 1969; Low to Faget, "Proposed lunar ascent TV package," 26 April 1969. 40. Faget to Chief, Mission Ops. Br., "Comments on 'Preliminary Lunar Landing Phase Photographic Operations Plan,"' 27 Feb. 1969; Noel T. Lamar to Chief, Photo. Tech. Lab., "Apollo 11 lunar surface color photography," 10 June 1969; Low to Phillips, 20 June 1969. 41. Phillips TWX to MSC, KSC, MSFC, Attn. : Gilruth, Kurt H. Debus, von Braun, 31 Jan. 1969; Johnston memo, "Symbolic articles to be carried on first manned lunar landing," 11 March 1969; Gilruth to Phillips, 13 March 1969; Gilruth to Luella Goodridge, 18 June 1969; Gilruth to Mr. and Mrs. Stanley A. Jacques, 18 June 1969; Slayton to Spec. Asst. to Dir., MSC, "First lunar landing mementos," 28 March 1969. 42. Thomas O. Paine to Assoc. and Asst. Admins. and Center Dirs., "Symbolic Articles to Be Carried on First Manned Lunar Landing," 25 Feb. 1969; Willis H. Shapley memo for record, "Meeting of the Committee on Symbolic Articles Related to the First Lunar Landing, April 1, 1969," 3 April 1969; Shapley to Mueller, "Symbolic Items for the First Lunar Landing," 19 April 1969. 43. Shapley to Mueller, "Symbolic Activities for Apollo 11," 2 July 1969; Alfred P. Alibrando memo, "Claims of sovereignty over the Moon," 11 June 1969. 44. Slayton to Ira Gallen, 1 April 1969; Low to Kraft, "Recovery of Apollo 11," 5 April 1969; Jack A. Kinzler to Dir., MSC, "Permanent booster spacecraft Apollo 11 memorial," 6 June 1969, with enc. ; Gilruth to Mrs. Harold Bennett, 16 July 1969.